The exact cause and evolution of ice ages still remain a mystery . Why did the Earth shift into an unstable climate with global oscillations of 4-5 degreesC every 100,000 years? What is the cause of the large scale glaciations with shorter warm inter-glacials? Proposed Milankowitz cycles cannot properly explain why their relatively small radiative effects apparently have been amplified during the last million years or why long term temperatures have been falling for over 20 million years. The work presented here does not attempt to explain the origin of the ice ages, but instead it tries to parameterise the observed temperature dependencies to derive as much quantitative information as possible. This approach applied in other branches of physics is called phenomenology. The amplitudes of Milankowitz harmonic cycles are derived from making fits to data. These fits are then used to predict the occurence of the next Ice Age with some confidence. 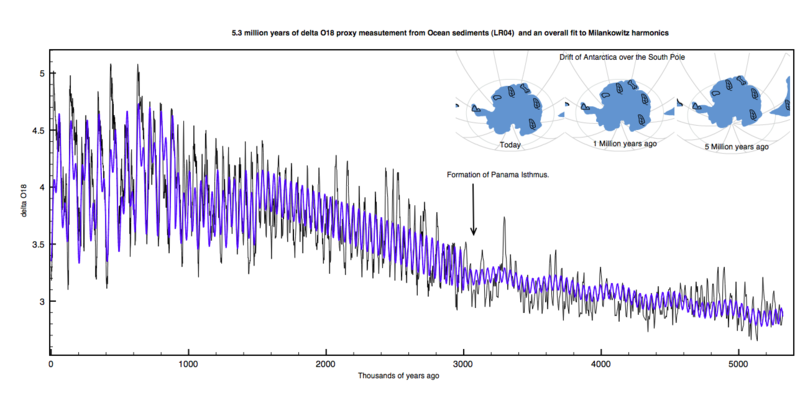 The “LRO4” data  is a remarkable set of global proxy temperature data spanning a 5.3 million year period throughout the pleistocene Ice Ages. It consists of a stack of 57 globally distributed benthic d18O records. Unlike the Vostok Ice core samples which measure temperature at a single site in Antarctica, LRO4 represent the global temperature and should therefore be more representative of climate changes. The data are based on samples of deep sea sediments consisting of calcium carbonate from plankton. The oxygen content (CaCO3) consists of a small amount of O18 mixed with O16. The ratio of O18 to O16 increases slightly with cooler surface temperatures. This is because O18 is slightly heavier and evaporates less readily than O16. Delta O18 is the ratio of O18/O16 compared to a standard Calcite value. LRO4 represents a global measure of this ratio from ocean sediments and can be directly related to prevailing temperatures at the time. It provides a unique overview of the onset of Ice Ages (Pleistocene Era) starting 5.3 million years ago. The combined fits compared to the data from both eras combined is shown below. delO18 = 3.25 -0.0002*(x-3000) -0.03*sin(0.015*(x-3000)-49.6) +0.07*sin(0.153*(x-3000)-31.3)) and is shown below. The full 5.3 million years of global temperature change as reflected in the LR04 data with the fits described above is shown in figure 5. This clearly shows a long term cooling of the climate leading to the severe Ice Ages of the recent past. Three proposals have been given for this long term cooling trend. The first is that Antarctica has moved to fully cover the South Pole, isolating any heat flow from the oceans and lowering the Earth’s albedo . The second proposal is that the Tibetan plateau has been slowly rising as India continues to crash into Asia. The increasing ice cover over a large tropical region then changed the Earth’s energy balance by decreasing albedo. The third proposal is that the closing of the Panama Isthmus 3 million years ago altered the flow of heat in the oceans leading to the Gulf stream. This brought more moist air to the polar regions resulting in more snow and ice. The Earth’s climate appears currently to be in a highly unstable state, with sawtooth-like oscillations every 100,000 years flipping between long glaciations and shorter warm inter-glacial periods. The onset of a new Ice Age is a gradual process ending when temperatures reach a lower limit flipping back rapidly to a warmer phase for 10-20,000 years. The fits demonstrate that the driver for this instability are the two cycles – eccentricity and obliquity. However the details of the correlation are surprising. 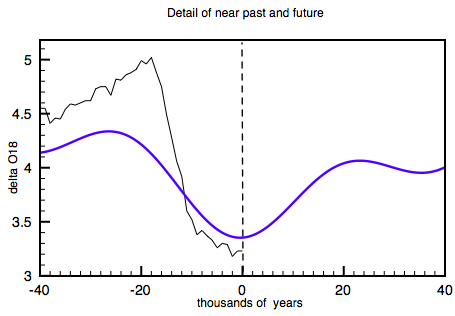 For the last 600,000 years Ice Ages have followed a 100,000 year cycle coinciding with the Milankowitz cycle. Every inter-glacial period has been in phase with a maximum in the eccentricity. This corresponds to increases in elipticity of the orbit, which seems counter-intuitive since it accentuates the variation in solar energy throughout the year. One fact though is that a smaller perihelion increases the maximum solar insolation. Unlike Ice core data the LR04 data are global and therefore must represent changes in total energy balance. From 600-900 thousand years ago the duration of Ice Ages shorten slightly to 84,000 years and further back disappear completely. It is as if the long term cooling trend needed to reach a threshold for the orbital eccentricity oscillation to kick in. The second clear observation is that the 41,000 change in the angle of rotation of the Earth to the orbital plain (oblicity) has had a major effect on climate for at least the last 5 million years. Surprisingly, the larger the tilt the warmer the climate, as demonstrated in figure 4. A larger obliquity means there are larger extremes in summer and winter temperatures. Both the Arctic Circle and the tropics increase in extent. I suspect it must be the second effect which wins out, and when this is coincident with large eccentricity with an annual closer distance to the sun – Ice Ages end ! Correlation of larger obliquity and warmer temperatures. Note that lower deltaO18 mean warmer global temperatures. The fit to data allowed a free phase component. The overall fit to 5.3 million years of proxy temperature data is not perfect but does reproduce the main features of the observed data. 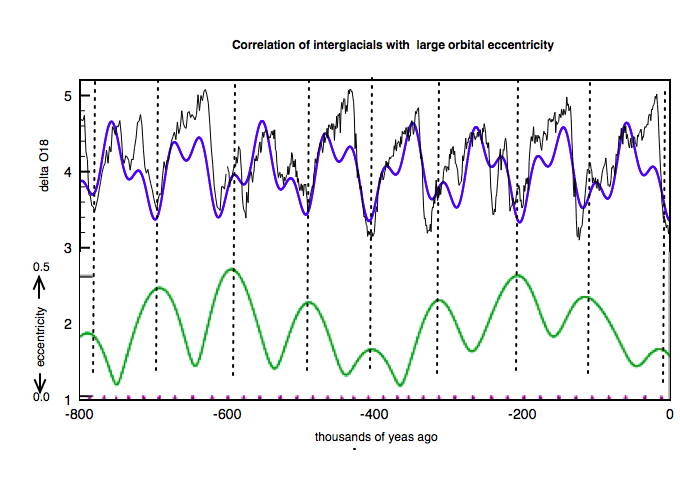 The rapid end to recent Ice Ages resembles better a saw-tooth oscillation rather than a simple harmonic. 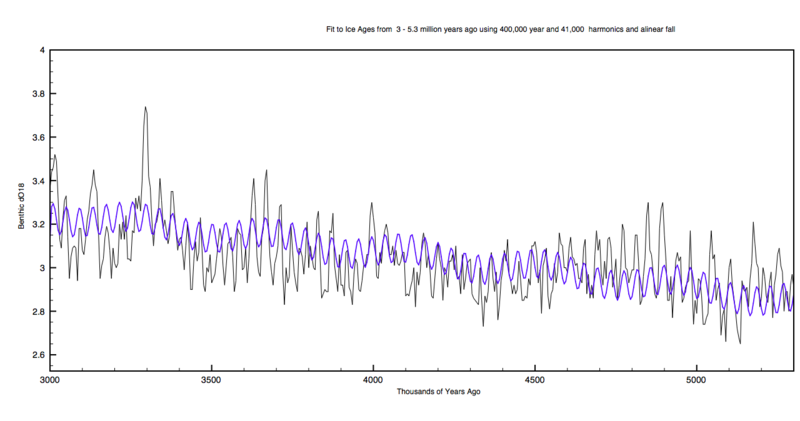 However the recurrence of Ice Ages over the last 600,000 years is very well represented by the fit. Therefore this fit can be used with some confidence to extrapolate into the future and thereby predict the onset of the next Ice Age. This is shown below. Next Ice Age due to start in 5000 years time. Within 10,000 years the Earth will be well on the way into a new deep glaciation which should peak 30,000 years into the future. By this time much of North America and Northern Europe will be under a huge ice sheet. Looking in detail at the data it can be seen that already within 2 thousand years from now, the climate will be noticeably cooler than the current climate. It appears to be the case that the climate is at its warmest period and will naturally begin to cool in the future. The earth’s climate has cooled over the last 5 million years leading to a series of major glaciations over the last 900,000 years. Various origins of this cooling have been proposed such as the movement of Antarctica over the South Pole and the uplifting of the Tibetan plateau. 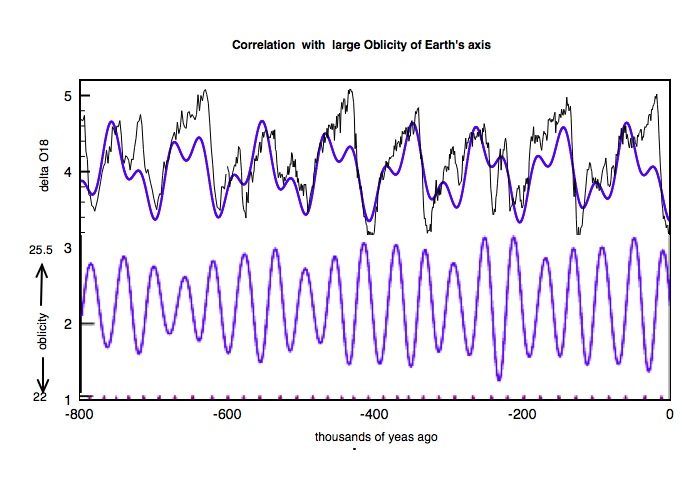 Detailed analysis of recent oscillations in temperature show a clear 100,000 year correlation with interglacials coincident with maxima of the elipticity of the Earth’s orbit. The oscillation is not present more than 1 million years ago, however a 400,000 year super-oscillation of elipticity is evident from 3 – 5.3million years ago. 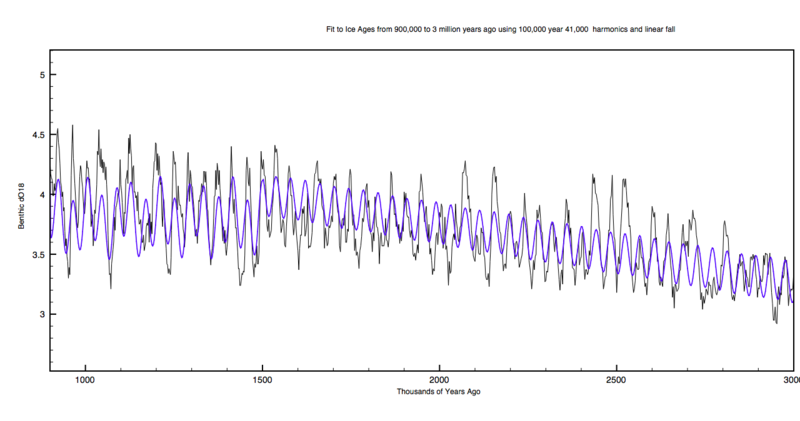 The 41,000 year Milakowitz oscillation is observed throughout the full 5.3 million years with warmer interglacials coincident with a maximum tilt of the the Earth’s axis. No evidence of a significant 23,000 year oscillation due to the precession of the axis of rotation is observed. 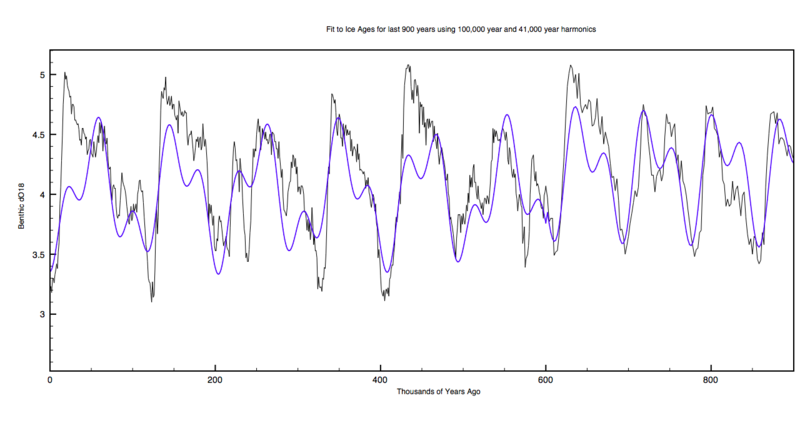 The parameterized fit to the LR04 data for the last 600,000 years reproduces all previous glaciations and therefore can be used to predict the next Ice Age. It is found that the Earth is currently at its maximum interglacial global temperature and will start cooling within the next 2-5000 years. 20,000 years from now the Earth will likely be in the depths of another major Ice Age. 2) Concise Dictionary of Physics: Phenomenological Theory. A theory that expresses mathematically the results of observed phenomena without paying detailed attention to their fundamental significance. 5) Raymo, M.E., W.F. Ruddiman, and P.N. Froelich (1988) Influence of late Cenozoic mountain building on ocean geochemical cycles. Geology, v. 16, p. 649-653. This entry was posted in Climate Change, Physics and tagged Ice Ages, Milankowitz.. Bookmark the permalink. Yes, Milankovitch cycles are questionable as to their explanation of the total picture. Hamaker’s hypothesis in light of the growing incidence of noctilucents may better fit the saw-tooth sine wave. Unlike the Milankovitch cycles theory, Hamaker’s idea does not let carbon dioxide pollution off the hook as to complicity with climate change but, conversely, blames it. Devil’s Hole study sought to be more accurate at dating than ocean sediments and shifts the start of ice age conditions to peak carbon dioxide content of atmosphere. 2008 coral deposit samples analysis found ice caps melted before major ice ages started twice for the last two major swings. Global warming triggers collapse of interglacials. 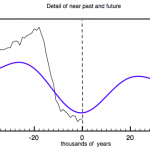 Pingback: Clive Best » Blog Archive » Part 2: What really causes Ice Ages ? - Is it Resonant Dust Clouds ? …… both cycles being 20,000 + years long (both the shortest cycles)…..
as super important and responsable for almost all paleo-everything….
. why dont the 2 cycles show up in your curves…? Yes I agree that this should be the largest swing of solar heating between northern and southern hemispheres. However, all this is 100% dependent on the orbital eccentricity. If the Earth had a circular orbit the precession of the equinoxes would have no effect at all. 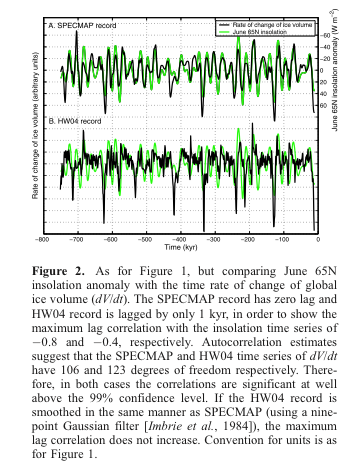 My gut feeling is that changes in solar insolation at the poles due to orbital tilt (obliquity) have driven glaciations for the last 5 million years. The Earth cooled for independent reasons triggering ice ages. 1 million years ago eccentricity for some reason dominated the cycle. This must be astronomical, unless I can be convinced otherwise. The next ice age will begin within 2000 years. It is a far greater threat to humanity and nature than the hype over AGW. It is impossible for humanity to stop another glaciation, but AGW could perhaps offset some of its effects in the short term. Why do we torment ourselves worrying about how to dispose “safely” of nuclear waste over 100,000 years when much of the northern hemisphere will be uninhabitable in 20,000 years ? Cosmic rays were found by CERN in 2012 to aid cloud seeding. Clouds are figured as a net cooling influence on Earth. Also, most cosmic rays are deflected by ours and the suns magnetic shield (Van Allen Belt) except when the polarity is changing. The sun flips every 11 years and the Earth about 100,000 to a million years. The Earth’s shield can also be temporarily be compromised by a coronal mass ejection from the Sun. Personally I think the ocean currents are paramount in Earth surface temp. Jackie asks: “Does the movement of our solar system in and out of the galactic plane present any significant basis for effects on our climate. Even though it is only every 26 million years or so”. In this context H. Svensmark, in a paper entitled “Evidence of nearby supernovae affecting life on Earth” has shown fairly convincingly that the movement of the solar system through the spiral arms of the galaxy has influenced the earth’s climate over the past 500 Million years. According to his theory (if I’ve understood it) as the solar system passes through the spiral arms the earth is exposed to a greater flux of Galactic Cosmic Rays (GCR) coming from supernovae. More GCRs provoke more cloud formation, raising the albedo, and thereby causing cooling leading to ice ages and lowering of sea levels. The results tie in very neatly with variations in marine biodiversity seen in the geological record. So if this theory is correct the effects of the movement of the solar system through the spiral arms, and in and out of the galactic plane would have an effect on earth’s climate – and this effect would have to be superimposed on the effects of the Milankovitch cycles to get the full story. Wouldn’t it Clive? According to Wikipedia the Sun takes 230 million years to orbit the centre of the Milky Way. During that time it traverses through about 6 or so spiral arms. This must effect the climate on Earth in some way. The time scales are too long to play a role in the recent regular glaciations every 100,000 years. However they must effect long term temperature trends including cloudiness through cosmic ray flux. 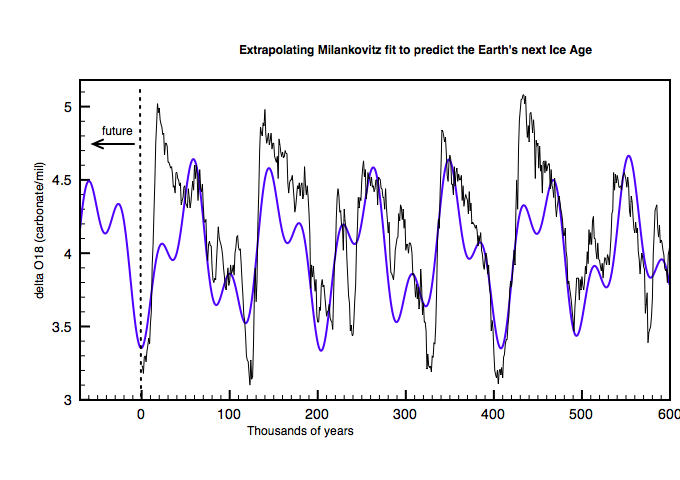 Perhaps ice ages can be better understood by comparing the rate of change in temperature with Milankovitz cycles. There is a paper by Gerard Roe (GRL) which shows much better agreement between rate of change or ice volume(T) and insolation. see -below. However it is still not obvious what triggers the end of an Ice Age. I don’t know where it best to bring up what I consider to be related. But the book listed below has a chapter on Glaciogenesis: The Cause of the Ice Epoch,” Chapter VI which may be of interest. One major fact that the theory covers is how rapidly the mammoths etc. were fast-frozen in Siberia and Alaska. In some cases the animal’s last meal had not even been digested before being frozen. This catastrophe may have been the last Ice Age but it surely came on quickly. Hey its almost been 100,000 years since my last post. Are we gonna heat up some more or cool off now. Seriously, why doesn’t your work here get more recognition? Good job Clive. Best theory I’ve seen so far. You are quite right – I should have written ‘thousand’ instead of ‘million’ ! a factor of 10^3 wrong! sorry. Clive, your combined fit back to 900,000 ya is pretty good I must admit, but there is no physical basis for choosing the amplitudes and phases of the sub-harmonics of the 41 ka obliquity cycle. Physically all we can say is that sometimes obliquity triggers a termination and sometimes it does not at random. Hence interglacials tend to be 40, 80 and 120 ka apart. In such a situation would it always be possible to get an apparent fit by suitable selection of amplitudes and phases of the subharmonics? Perhaps a Monte Carlo experiment could settle this. I think there is a physical basis for the 41ka obliquity cycle because one or other of the poles is receiving higher summer insolation with higher obliquity. The summed polar insolation shows a regular increase. For the first 4 million years the glaciation cycle was ended regularly with maximum obliquity. As general cooling continued the ice sheets becam too large for a single cycle to melt them back and something else was needed. There was a small period when 2 cycles were sufficient before the current phase set in with 3 obliquity cycles coincident with maximum eccentricity. The possible reason for that is another story http://clivebest.com/blog/?p=5464. What I meant was: what is your justification for including a component of 83.77 ky period (angular frequency = .075) and what is the physical significance of its phase and amplitude? The existence of a 100ky eccentricity cycle is questionable – terminations are separated by 40, 80 or 120 ky. There is no 100 ky period evident to the naked eye. The bottom line is that climate is primarily a stochastic process not a deterministic one.